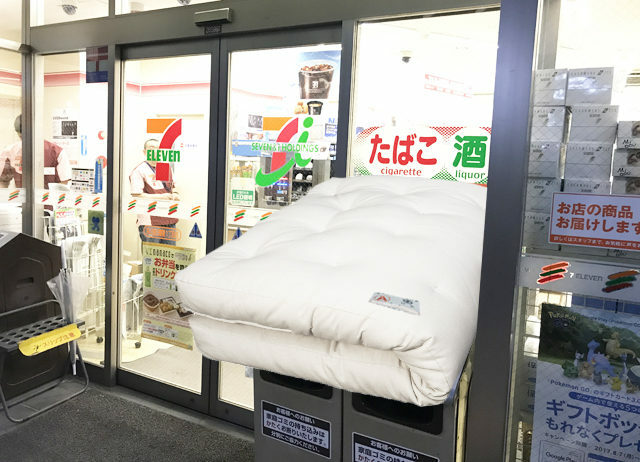 A foreign resident living in Tokyo disposed of his three-year-old futon yesterday at the local convenience store before sneaking off into the dead of the night. “Damn, that’s a real weight off my shoulders,” said Jon Lee. Lee exhausted all other available options before getting rid of the futon at the local convenience store, including attempting to hacksaw his way into the garbage cage down the street. Lee says he placed a large garbage collection sticker on the futon, which his girlfriend told him he needed to purchase before throwing it away. Lee says he managed to get rid of around 17 pet bottles at the konbini before disposing of the futon. I disposed of a couch by chopping it into little bits, bagging them up, and putting the bags out in the designated day. Only glitch: the garbage collectors said I had too many bags, so, had to space it out over a couple weeks. Big garbage disposal days are awesome. I actually managed to haul a pretty much brand new kotatsu home one night…(much to my Japanese husbands disgust). You don’t want it…I need it…FREE FOR ALL! Queen size box spring in 5 XL bags @ ¥30 each, took metal to recycle center, made ¥92. Cost less than the ¥300 disposal sticker. futon disposal day is mentioned in the Kojiki as 18/11/2061 more commonly known as pamyupamyu 21. If Gaijin want to break the rules and do as they please, living in Japan is perhaps not for them. May I recommend North Korea.